A new image captured by the Hubble Space Telescope shows the planetary nebula NGC 3918, nicknamed the “Blue Planetary” or “The Southerner”. Its shape in some ways reminds of an eye with special colors and seeing it is a lucky event because it will not last long in astronomical terms since this phase will end within a few tenth of millennia. 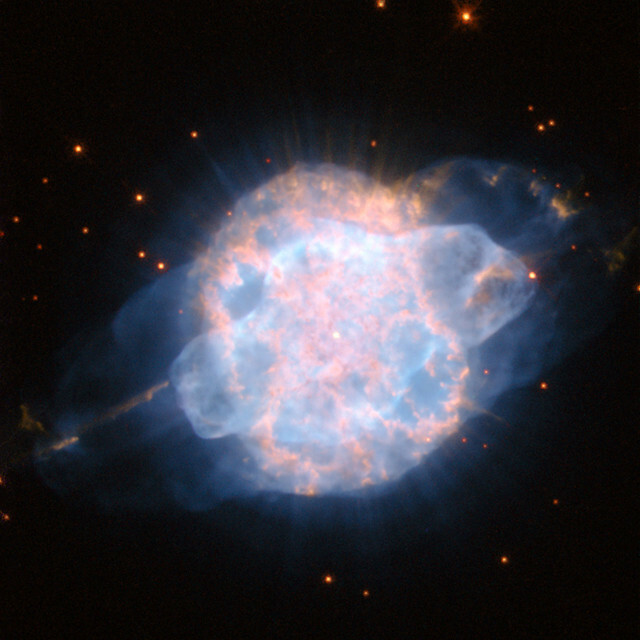 The expression planetary nebula is the result of an error of interpretation by astronomers who had limited instruments available and mistook them for formations similar to the solar system’s gas planets. Actually, they represent a short phase in the life of a star of mass similar to the Sun when it becomes a red giant and its outer layers get ejected. The intense ultraviolet emitted from the star’s core ionize the layers of gas, which consequently emit electromagnetic radiation and that’s why NGC 3918 glows. The NGC 3918 nebula is about 4,900 light years away from the Earth according to estimates offered by NASA but other sources provide very different estimates. It was discovered in 1834 by the English astronomer John Herschel thanks to the fact that it’s visible with small telescopes like those available at that time. It was Herschel who nicknamed it “Blue Planetary” for its color. In recent times, technological advances offered instruments that are vastly superior to the ones even conceivable two centuries ago such as the Hubble Space Telescope, which captured the details of the structure of the NGC 3918 nebula. The shape of a planetary nebula depends a lot on the processes under way inside it: in this case the peculiarity is given by the presence of two gas shells, a bright inner one and a more diffused outer one which extends into space. Initially, astronomers thought that two separate ejections generated the two shells of the NGC 3918 nebula but further studies led to the hypothesis that they formed at the same time but were ejected from the progenitor star at different speeds. From the borders of that structure powerful jets of gas emerge that are shot outside at speeds that can reach 350,000 kph (217,500 mph). Probably there will be new attempts to measure the speeds of the various gas flows within NGC 3918 to better understand the processes underway. This new image of the NGC 3918 nebula is the result of a composition of separate exposures obtained in the visible and infrared light of the Hubble Space Telescope’s Wide Field and Planetary Camera 2 (WFPC2) instrument. Different hues were assigned to each monochromatic image associated with the various filters used to create the final result. Planetary nebulae often offer great shows because the agony of the stars in their center goes through violent processes until they become white dwarfs. The interest of astronomers goes far beyond the aesthetic side because in about five billion years the Sun will also go through that kind of phase.